Golgotha. (known as the place of the Skull ). Please note that the exact location of Christ's crucifixion is not certain. The photo shows a possible location. Adjacent to this rocky cliff is a Garden Tomb. 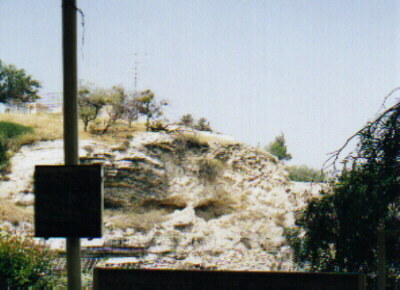 British General Gordon identified this location as Golgotha. This location does line-up with John's account in John 19 v 41. Here John says: "At the place where Jesus was crucified, there was a garden, and in the garden a new tomb." This location could therefore really be the site of Christ's crucifixion.